The qualifier from Qatar, Saudi Arabia, Oman, Bahrain, UAE will join as the 8th team. Indian junior selectors left out Prithvi Shaw and Shubman Gill, as selectors felt they will benefit more playing at Ranji. BCB’s contact with Manhas, however, extend up to 2019 from the October, 2017 assenting the Under-19 World Cup which is going to kick off in three months from now on, as the first mission of the Indian coach. “Listen, when you are in the battle field, it is not wise to take anything lightly,” Manhas said. “The work to do within the field is always tough and improvement is a continuous process,” he added. In recent past, Bangladesh Under-19 underwent a 3-1 series defeat against Afghanistan Under-19 that has been criticized in the media since then. So which BD players are we meant to look forward to? After that dismal performance against AFG U-19. We will be knocked out early. The talent has dried up for the time being. Hassan Khan (Capt), Muhammad Mohsin Khan, Umair Yousaf, Zaid Alam, Haider Ali, Rohail Nazir (W/K), Abdullah Shafiq, Muhammad Hammad Khan, Muhammad Taha, Saad Khan, Ashar Qureshi, Musa Khan, Shaheen Shah, Muhammad Ali and Munir Riaz. The Bangladesh youths will leave for Hong Kong today to take part in a six-a-side tournament today as part of their preparations for the upcoming Under-19 Asia Cup, slated to start in Malaysia from November 8. South Africa, Sri Lanka, New Zealand, Pakistan, Australia, Marylebone Cricket Club and the host nation will also take part in the tournament, which will be followed by the ICC Under-19 World Cup in New Zealand next year. Ahead of the tournament's start on October 28 the eight teams were divided into two groups, with Saif Hasan's side being pitted against New Zealand, Sri Lanka and Australia. BCB age-level selector Ehsanul Haque believes the competition will help cricketers gain confidence in their power-hitting abilities. "The batsmen will get the opportunity to improve their skills in the competition and that is why we decided to send our cricketers to Hong Kong. The batsmen can gain confidence in power-hitting by taking part in such tournaments," Ehsanul told reporters yesterday. After the trip to Hong Kong, the Bangladesh team will return to play a three-match one-day series against their Nepalese counterparts, who will arrive in Dhaka on October 30. Instead of allowing these youths to focus on proper cricket we send them to HK sixes? ^^ I suspect the idea came from coach Damien Wright. Little bit surprised to see Yasin Arafat Mishu on the stand-by list! Is Qazi Onik the Kazi Anik? Our boys will take on Nepal again this Saturday, at Kinrara Oval cricket ground. Nepal should be boosted by their last win against us. Other two teams in the Group A are India and Malaysia. This team will finish 3rd at best. Sad what we've been reduced to. I'm sorry but pinak has been a huge disappointment, saif and afif should be doing better at this level but maybe they are more focused on bigger things as they've both done pretty well domestically. I guess we should not judge our team so harshly for failing against those older Afghan boys, Pakistan U/19 all out for 57 runs. Mujeeb Zadran 6/23. 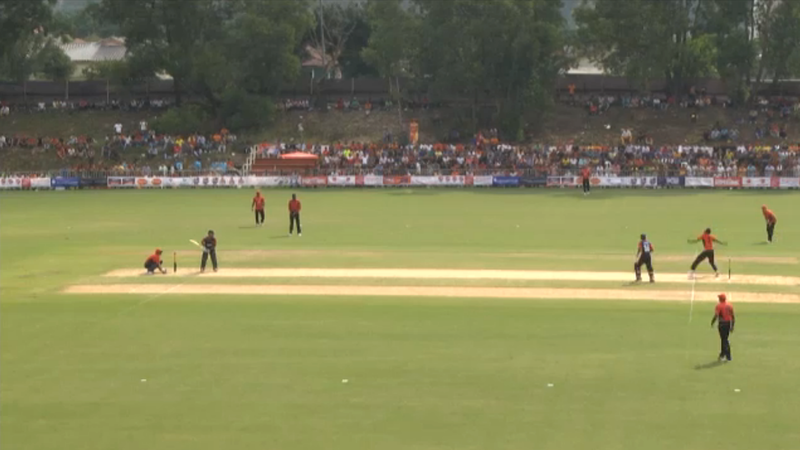 Tight bowling from our boys so far, Nepal 55/2 after 15 overs. Match reduced to 43 overs due to rain. Saif won the toss and decided to bowl first. For a small ground like this, those older Nepalese guys still not getting enough boundaries. I think that's the main problem with Nepal team - lack of muscle power. Anyway, credit to our boys too. 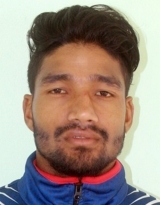 Nayeem got his second wicket, third wicket down for Nepal.